Overview: Our Free Jacks or Better Video Poker game obeys the standard video poker rules and is a single hand type video poker machine. It is played with a standard 52 card deck and the cards are shuffled before each hand. This version of video poker is sometimes referred to as Jacks Poker. Jacks or Better is almost identical to Tens or Better Video Poker however the pay table for Jacks or Better pays our higher amounts for getting a Full House or a Flush, this is offset by the fact you need to get a pair of Jacks or Better to win. Wild Cards: There are no wild cards in Jacks or Better video poker. Winning Hands: Jacks or Better can be won by getting any one of 9 winning hands, these are; Royal Flush, Straight Flush, Four of a Kind, Full House, Flush, Straight, Three of a Kind, Two Pairs or of course a pair of Jacks or Better. 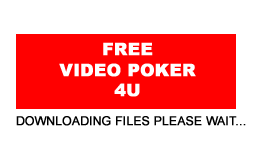 Similar Free Video Poker Games: If you like our Jacks or Better Video Poker game you might also enjoy playing our Double Double Bonus Video Poker which offers you even more winnings hands, or maybe you would like to try a game with some wild cards like our Free Deuces & Jokers Video Poker. Alternativly you might like to try playing more than one hand a time if so then why not try our Free Multi Hand Deuces Wild Video Poker, which allows you to choose to play between 2 and 4 hands at a time.